ST. THOMAS – On March 28, both University of the Virgin Islands’ campuses flourished with students, faculty, staff and alumni sporting the university’s paraphernalia. The festivity dubbed Pride Day was chosen to take place in March to signify the university’s Charter Day. Implementing Pride Day, the university used the event to not only reflect on its impact on the territory, but also on alumni. UVI community members were all encouraged to wear some form of the school’s apparel to show school spirit. To gain more participants, both UVI Bookstores offered 20 percent off all UVI apparel from March 26-28. UVI Students showing their UVI Pride. Additionally, the event trended on social media. Participants posted pictures or spoke of their most memorable UVI moments. Using the hashtag UVI Pride Day, These photos were then uploaded to sites such as Facebook, Twitter and Instagram. The Access and Enrollment Services staff, alongside UVI President Dr. David Hall, reached out to local high schools to celebrate Pride Day. Both the Charlotte Amalie High School and the Ivanna Eudora Kean High School took their turns as each school’s marching band lead a small parade for the occasion. Pride Day was an event the university’s community saw as an additional way to showcase love for the institution. It also served as a reminder as to why UVI was their final choice. 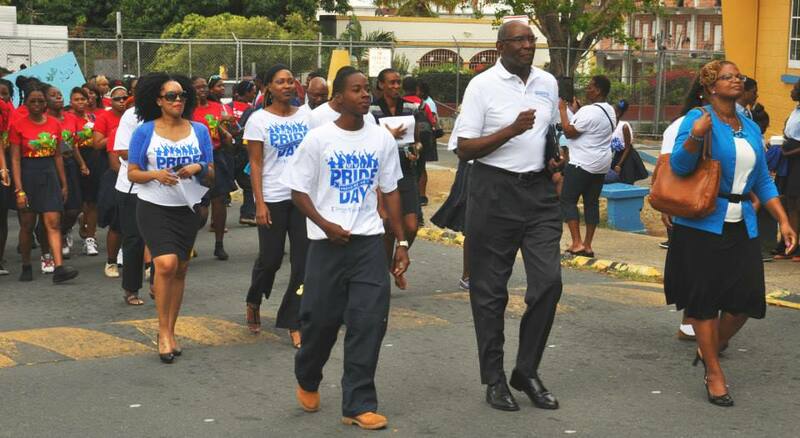 Dr. David Hall, UVI Staff and Students of the Charlotte Amalie High School at their Pride Day Parade.